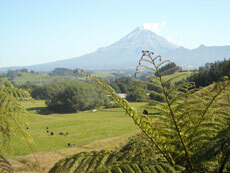 Situated midway up the west coast of the North Island is Taranaki. Taranaki has an abundance of rivers, sea, surf beaches and bush walks. The dramatic snow-topped volcanic cone of Mount Taranaki (also known as Mount Egmont) dominates the magnificient landcape and is the heart of the region. Main centres include the progressive city of New Plymouth, Hawera, Stratford and Inglewood. The Taranaki region has a spherical coast which means it collects 180 degrees of all possible swell, making it New Zealand's most consistent surf region. The "Surf Highway 45", which stretches along the coast from New Plymouth to Hawera, offers visitors a fantastic array of surf breaks to choose from. The Egmont National Park encompasses Mount Taranaki which has a track system that caters for those wanting easy short walks as well as more experienced walkers and climbers. A variety of easy, short walks branch off the main access roads. A number of beautiful waterfalls are in easy reach of Dawson Falls and it is worth walking through the Goblin Forest to Wilkies Pools - a series of plunge pools. During the winter months Mount Taranaki becomes a place to ski with a small club field, Manganui Ski Field. Stratford is a great place to stay for those interested in exploring the mountain and park. Visit the Sugar Loaf Islands Marine Park to see seals and other marine life. Cruise tours are available daily (weather dependent). In contrast with its outdoorsy lifestyle, New Plymouth has an artsy side - it’s home to the acclaimed Govett-Brewster Art Gallery. Or perhaps just spend the day soaking your bones at the Taranaki Mineral Pools. The Taranaki region could be your next holiday destination. The links below will help you guide your search through all the information on KiwiWise regarding the region of Taranaki.